Today I had the opportunity to discuss VDI protocols on a panel with Citrix and Quest at the Gartner Catalyst conference. My thanks to Chris Wolf and Gartner for the opportunity. I took the chance to officially announce that the next release of VMware View will feature a new version of PCoIP that brings down the consumption of bandwidth in WAN environments down by up to 75%. You can read the technical details in this blog post by Warren Ponder, our protocol guru. It is really amazing to work with the VMware engineering team. It is scary to see what they can achieve when they put their mind to it. We have a history of great innovation, but we also listen to our customers and we mobilize around their requirements.And this is what we did to address 1 and 3 above (in collaboration with our good partner Teradici). Over the last 18 months we took care of 3 above (Broad endpoint device support). It took longer than we wanted as I explained this other post but today with the availability of the View Client for iPad and Android we cover 92% of the devices out there. As per today’s announcement, when the next release of View ships we are going remove the final technical hurdle (WAN performance). The above with our platform leadership and superior ease of use (as per Gartner Chris Wolf) and manageability (check out this other post to see for yourself), reaffirm VMware View as the clear leader of the very market we created 5 years ago. We never rest and I am looking forward to a great VMworld in Vegas in a few weeks. It’s the best solution for Virtual Desktop! I love View…. I truly believe CTXS is disregarding anything from VMware as their heads are too far in the a**. Please hand it to CTXS. The CTXS management team is completely clueless. Their SVP of sales is even telling everyone that VMW will not focus on VMW View. 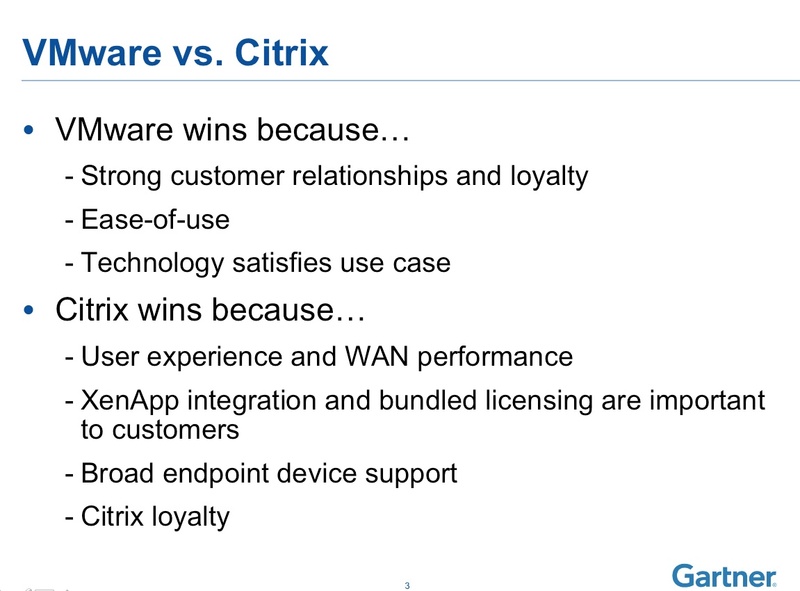 Guess what, VMW spends more money on View than Citrix even spend on XenDesktop.